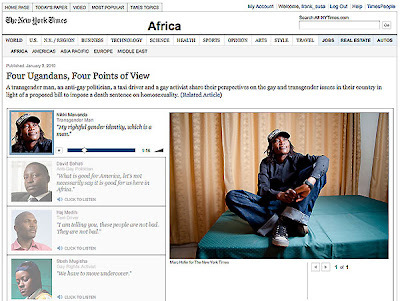 Wow - Listen to these first person perspectives coming from Uganda in response to recent anti-gay legislation. They are really astonishing! This NY Times media feature includes statements by a transgender man (f2m), a religious fundamentalist, a straight ally, and a gay rights activist.